CLIFFORD TOWNSHIP PA–A very special place continues to come alive in Clifford Township. Since last spring, the Clifford Township Historical Society (CTHS) has been working tirelessly to raise funds, to collect designs and ideas, to build, install, and plant to literally ‘grow’ the group’s newest and most unique project: a Children’s Garden. The concept for Clifford’s Children’s Garden was initially developed to create a safe and interactiveplace for children to play and was modeled after the Ithaca Children’s Garden. Looking beyond mere swings and slides, the CTHS offered a way in which children can play while also learning about nature, the area’s own rich history, and its inherent ecology. With the enthusiastic support of the township supervisors, the one-acre site next to the Community Center has literally been growing throughout the summer months, as countless volunteers have shared their time and lent their helping hands to turn a fun-filled idea into an expressive reality. Funding for the project has been provided through grants and donations. “Clifford’s Children’s Garden is unusual in that it’s a different and very unique way to engage kids in fun and creative play, and all within a safe environment,” added Annette Schultz, Executive Director of the Endless Mountains Heritage Region. “And with the teaching elements of history involved to help visitors better understand the background, the people, and the lives of those who were here before us … well, that’s a definite added asset. For additional information about the CTHS or to share and participate in the Children’s Garden and their various activities, contact them at 570-679-2723, swilmot@echoes.net or at www.cliffordtownshiphistoricalsociety.org. Known locally as “the little society that does big things,” Wilmot believes that the Children’s Garden will be another project that will make the Society, the youth involved, and the entire community proud. 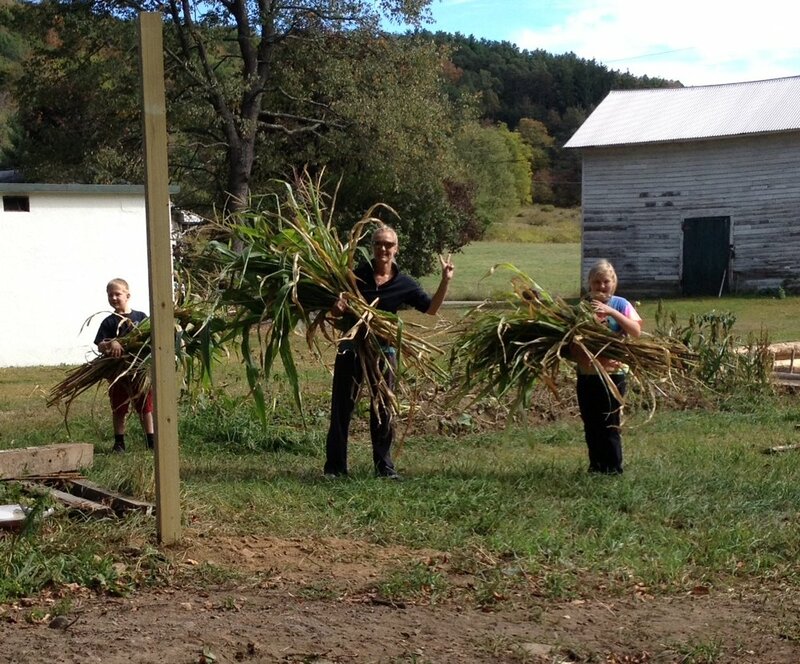 Conrad, Christine, and Ava Depew of Clifford have fun gathering cornstalks to sell as a fundraiser for the Clifford Children’s Garden. 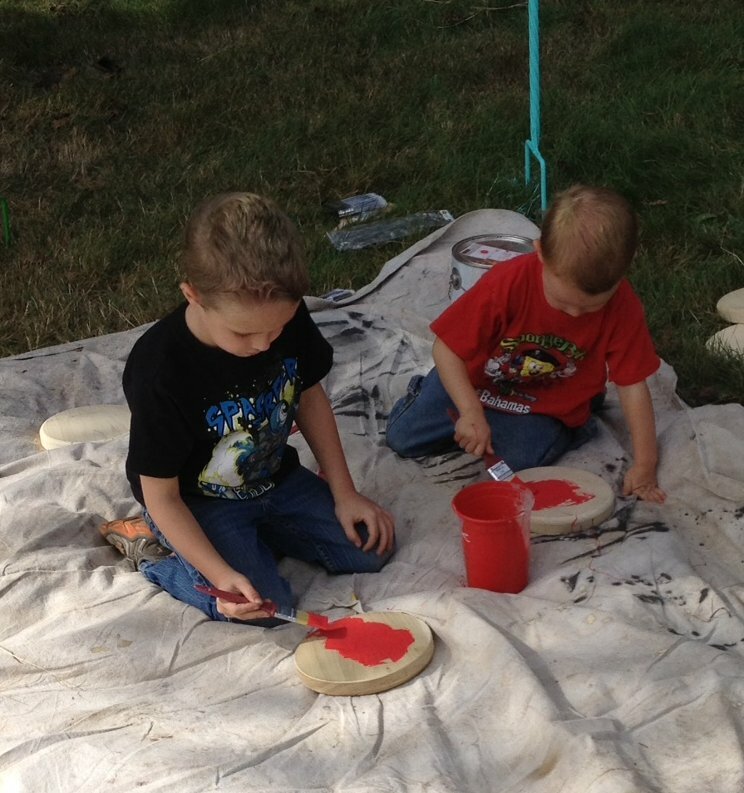 Gage (age 4) and Ryker (age 2) Mead of Clifford busily paint the human-sized checkerboard for the Clifford Children’s Garden. Written by Union Dale freelance feature writer Karen Bernhardt Toolan for the Clifford Township Historical Society, with thanks to the Susquehanna County Room Tax Grant Fund through the Endless Mountains Visitors Bureau. CliffordTownshipHistoricalSociety.org is funded in part by the Susquehanna County Room Tax Grant Fund and the Endless Mountains Visitors Bureau. Application for this funding was submitted by the Clifford Township Historical Society, Inc.